Learn to use the CData API Server and the ADO.NET Provider for Redshift to write SAPUI5 apps that leverage the Redshift API, without writing to a backend database. Use the built-in ODataModel class in SAPUI5 to create Web apps that reflect changes to Redshift data in real time. In this article, we show how to use the CData API Server and the ADO.NET Provider for Redshift (or any of 120+ other ADO.NET Providers) to write SAPUI5 apps that leverage the capabilities of the Redshift API, without writing to a backend database. The API Server is a lightweight web application that runs on your server and produces OData feeds of Redshift data. OData is the standard for real-time data access over the web and has built-in support in SAPUI5 and OpenUI5. After you deploy the API Server and the ADO.NET Provider for Redshift, provide authentication values and other connection properties needed to connect to Redshift by clicking Settings -> Connections and adding a new connection in the API Server administration console. Server: Set this to the hostname or IP address of the cluster hosting the Database you want to connect to. Port: Set this to the port of the cluster. Database: Set this to the name of the database. Or, leave this blank to use the default database of the authenticated user. User: Set this to the username you want to use to authenticate to the Server. Password: Set this to the password you want to use to authenticate to the Server. Open the Amazon Redshift console (http://console.aws.amazon.com/redshift). On the Clusters page, click the name of the cluster. On the Configuration tab for the cluster, copy the cluster URL from the connection strings displayed. You can then choose the Redshift entities you want to allow the API Server access to by clicking Settings -> Resources. This article uses Orders as an example. In SAPUI5, you do not need to write any OData queries; an ODataModel instance handles the application's data access commands. The API Server then translates the queries into Redshift API calls. The controller processes user input and represents information to the user through a view. Define the controller in a new file, Controller.controller.js. Instantiate the model in the onInit function — you will need to replace the placeholder values for the URL to the API Server, a user allowed to access the OData endpoint of the API Server, and the authtoken for the user. 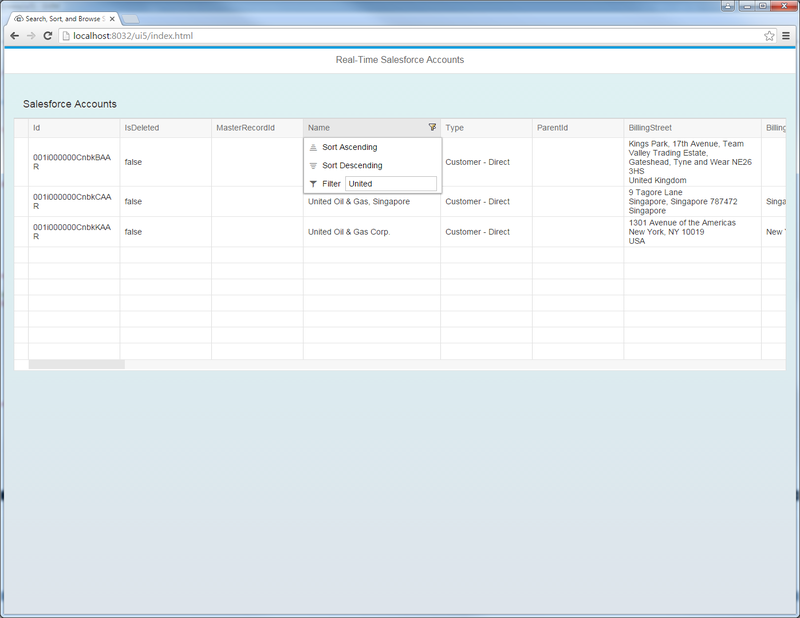 height : "100%", name : "sap.ui.table.sample.OData2"
The resulting SAPUI5 table control reflects any changes to a table in the remote Redshift data. You can now browse and search current Redshift data.